Thanks everyone. I'll check out the links. Sounds like Crater may be out of the picture, but do appreciate the other options. I'm really keen on seeing Clear. One for the geology and the other for seeing how clear, clear is compared to what I've dove in other locations. Definitely glad to hear you have dry suits because if you dive Clear Lake YOU WILL NEED IT!!! I tried to dive Clear Lake last year and it was seriously cold. Your best bet is to contact Eugene Skin Divers in Eugene. Clear Lake is a good dive however Clear Lake is only 37 to 39 degrees even in summer. Clear Lake is also an altitude dive. Florence North Jetty or Woahink Lake may also be good options. I do not think the National Park Service is currently issuing permits to dive Crater Lake. They are working out procedures for invasive species control. 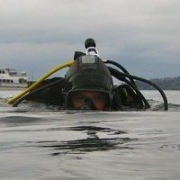 Oregon Scuba Club will not be diving Clear Lake until 23 August or I am sure you would be able to join them. You could however check out their Facebook page to ask questions and find buddies with local knowledge. Also, you might try giving Eugene Skin Divers Supply a call to see if they have anything planned, probably once it gets closer. Clear Lake is pretty neat. Not much life but the underwater geology and clear water are the attraction. It's about a 1.5 hour drive from Eugene and only about 3000ft elevation which makes it a more practical day trip. Waldo (which I haven't done) is supposed to have even clearer water, but being at 5500ft it's more of an elevation dive. Last I heard Crater Lake had been closed to divers until further notice--not sure if that's been lifted. It's even higher elevation and you have to carry all your gear quite a ways in and out of the steep crater without using anything with wheels. I'd definitely recommend a drysuit since the water temperature is in the high 30s year round. Desert Diver wrote: I don't know anything about Oregon diving, but have you used your drysuit yet? I don't know anything about Oregon diving, but have you used your drysuit yet? I will be traveling to OR in August for business and plan on diving in the area on August 16-17 (staying in Eugene, but can change). Having never dove the PNW but put in hundreds of carribean dives under my belt I am looking forward to it. I've been reading about a few sites (Clear Lake, Waldo, Crater, etc) and could use some advice on where to go during these two days. I'm leaning towards Clear Lake since I've read a few articles about the vis and really want to see how it compares to other places I've been. Are there other sites that you would recommend as "must dive" locations? Are their any dive clubs going anywhere good locally August 16-17? ps.....yes, I already have my drysuit and thermals.